DUNDALK, ON—Toronto’s crap may soon be coming to Dundalk. But not if a coalition of concerned Dundalk residents, Six Nations land defenders, and their Toronto allies have anything to say about it. With the blessings of Southgate Council, which governs the verdant plateau where Dundalk sits, Ontario’s Lystek International Inc. has broken ground on the creation of an “Eco-Park” facility to make big-city offal a little less awful, then make additional cash by selling it to farmers for fertilizer. The opposition to this project isn't a Not-In-My-Backyard thing. The organic waste that flows through city sewers is not exactly black gold: it contains the leavings of industrial and urban activities including medical, manufacturing and auto waste. And it definitely has a smell. If the sludge facility operates as proposed it will be a mere 350 meters from the Dundalk and Proton elementary school. Human waste retains useful elements for the soil, and in balanced conditions it is a resource for plants. Cultures that last more than a few centuries (such as the Haudenosaunee at Six Nations) understand that, to preserve the water and food supply beyond the next quarterly report, you must be careful where you put it. You don’t put it on a plateau that frequently floods (earning the township the nickname of Floatin’ Proton) then absorbs and filters the headwaters that become the Grand and Saugeen Rivers. The gentle people who greet us politely suggest that I keep my gift to the earth where I can personally enjoy its dubious benefits. Ruby Montour of Six Nations didn’t mince words when she assured Dundalk residents of Six Nations support in resisting a project that has implications for the water and food supply of one of the most fertile areas of Canada. The Dundalk community is new at demonstrating. They are still press-shy, but welcomed those who came to walk with them and to learn about their community. 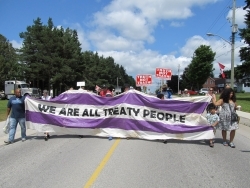 The contingent carried a giant flag of the 2-Row wampum, considered the earliest and most foundational agreement between European and Haudenosaunee nations, where the nations vowed to travel in parallel, not interfering with one another but co-existing in a spirit of peace, friendship and respect. The town was quiet, and marchers were met with bemusement and warmth. Reflecting the closed, rushed process that residents say led to the Southgate Council’s agreement to host the waste facility, lawns sported “Truth not Trash” signs. To those who had also walked with Six Nations in Caledonia on April 28, it was a welcome change to get the thumbs-up in Dundalk instead of shouts of “Go home!” that greeted marchers in Caledonia. One household gave out cold water to thirsty walkers. A picnic across from the Eco-Park further cemented relations between Dundalk and Six Nations. Making a gift of the Haudenosaunee flag at the request of a Dundalk community member, Six Nations resident John Henhawke gave a very brief account of the history this flag embodies, of how five and then six conflicting nations created a peace, to form the Haudenosaunee Confederacy. This was an extraordinary gift: for the Haudenosaunee are very careful to ensure that those who fly their flag are respectful, and allied to their causes. Dundalk residents who, with the help of Six Nations have been barricading the road to the Eco-Park, are also taking the issue to court; at the demonstration, they heard that Six Nations will be using the1701 Nanfan treaty, the UN Declaration on Rights of Indigenous Peoples, and the 1784 Haldimand Proclamation to help fight this battle. Deb O'Rourke is a contributing member of the Toronto Media Co-op. This piece was produced by the Toronto Media Co-op. For videos about Dundalk's residents' fight against the Eco-park, click here and here.